Welcome to the Hannibal LIONS Club! Here's where you'll find out who our upcoming speakers are, who belongs to our club, a few fun photos and how to join us. We meet every Wednesday at noon at Golden Corral on McMasters's Avenue. We have a great group of members who have fun every week. 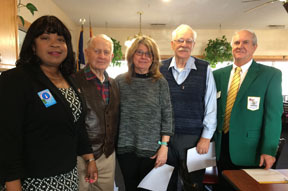 As one of our members put it, "I've visited every club in Hannibal, and the Hannibal LIONS Club was having the most fun - so that's the club I joined." Take a look around and come have lunch with us. You'll have a good time while doing good in the community. Lions meet the needs of local communities and the world every day because they share a core belief - to serve their community. Every year our Lions Club Pork Steak Barbecue is our biggest fundraiser. All proceeds go to help people in our community with eyeglasses, eye exams and other eye related health issues. So when you buy a pork steak dinner, you're giving back to the community. It is usually held the second Wednesday in August and we serve both lunch and dinner. The Hannibal Lions Club is the 46th in the world! We were the first Lions Club in Missouri and in 2017 we will proudly celebrate our 100th year. Lions Clubs International is the world's largest service club organization. We have 1.35 million members in more than 45,000 clubs in more than 206 countries and geographic areas. Lions award grants. Since 1968, the Lions Clubs International Foundation (LCIF) has awarded more than US$700 million in grants to support Lions humanitarian projects around the world. LCIF was also ranked the number one non-governmental organization in a 2007 study by The Financial Times.